Together, we are advancing a movement for the rights and dignity of immigrant women workers by building power through legislative advocacy, grassroots organizing, and leadership development. In California, more than 2 million private households rely on the labor and services of domestic workers, such as house-cleaners, nannies, and in-home attendants to seniors and people with disabilities. This workforce is comprised primarily of immigrant women of color, and many are the primary breadwinners for their families. 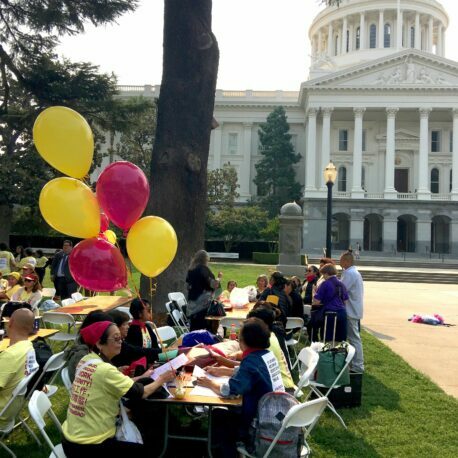 Founded in 2006, the California Domestic Worker Coalition (CDWC) is the state’s leading voice for the more than 300,000 domestic workers in California. The CDWC is a domestic worker led, statewide alliance of community-based organizations, domestic employers, worker centers, labor unions, faith groups, students, and policy advocates. We’ve come together to confront a history of exclusion to basic labor protections and to advance the rights and dignity of domestic workers and their communities across the state.